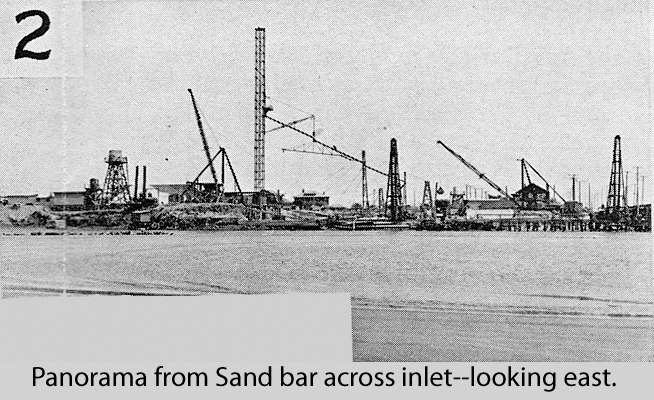 Judging by our web traffic stats, the power plant that stood at Ocean Avenue and First Street from 1925 to 1967 has been the most popular of all the Seal Beach history covered in this blog. Our first post on the steam plant took a photographic tour through the four decades of the plant’s existence, and you can find it here. Our next two posts showcased photos and a video by Joyce Kucera of the final days of the steam plant as it was being demolished and you can see the photos here and watch the video here. 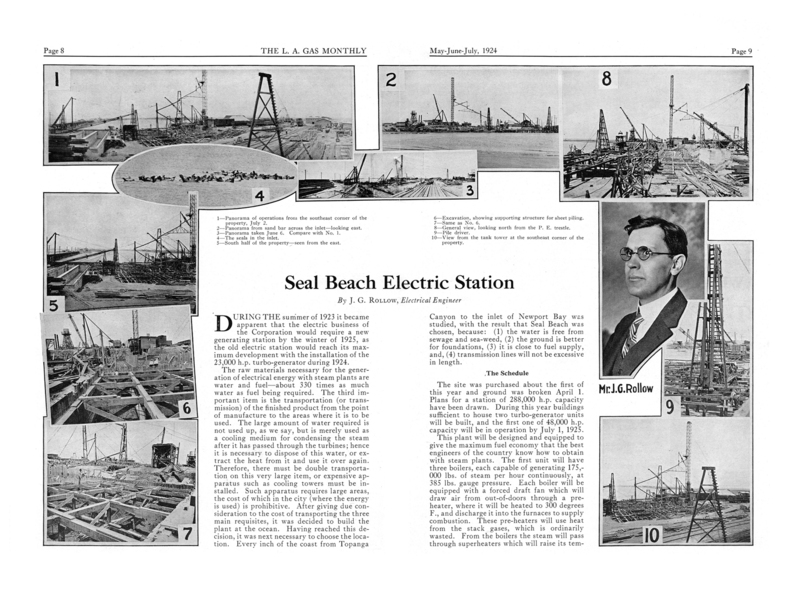 Today’s post will probably be our last on the steam plant for awhile, so it is fitting that we are going back to the very beginning of the Seal Beach power plant. The bulk of this post is an article published in the May-June-July, 1924 issue of The L. A. Gas Monthly. This article came to us courtesy of Eric Lawson who runs a web site dedicated to the historical aspects of The Southern California Gas Co. called Gastorical.com. The article is written from a technical perspective and may be a little more than the average layman needs to know, but it is still fascinating. Not only does it listed some of the dimensions and physical features of the still being constructed steam plant, but the article includes some amazing photographs from the early stages of construction. Our local landmark was an example of cutting edge technology when it was built. 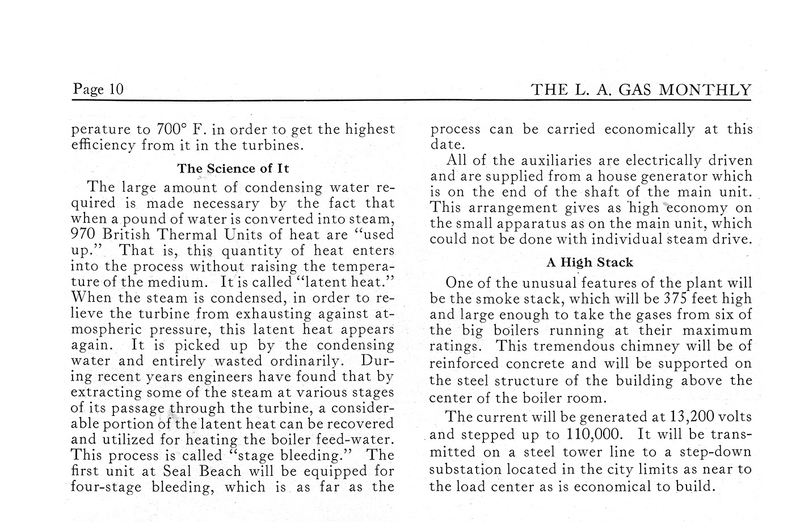 The steam plant went online in July 1925, and it is amazing that the technology so glowingly described in the article was obsolete a mere twenty-six years later when the plant was closed for good in 1951. The author is a gentleman named J. Grady Rollow. In late 1920, he left his position as a chemical engineer with E. I. du Pont de Nemours and Company (known to most of us today as DuPont) to become a consulting engineer with the Los Angeles Gas and Electric Corporation. In 1919 and 1920, Mr. Rollow had written articles given slide presentations about designing boiler plants, and his new position gave him an opportunity to design and build a modern steam boiler plant based on his ideas and expertise. As mentioned before, this following article is a piece of dry, technical writing, but it is hard not to detect Mr. Rollow’s pride and excited anticipation of the project coming to completion. Mr. Rollow remained a lead engineer for the Los Angeles Gas and Electric Corporation well into the thirties and probably was also involved in the repairs and installation of the shorter smoke stack after the Long Beach earthquake. During the summer of 1923 it became apparent that the electrical business of the Corporation would require a new generating station by the winter of 1925, as the old electric station would reach its maximum development with the installation of the 23,000 h.p. turbo-generator during 1924. The raw materials necessary for the generation of electrical energy with steam plants are water and fuel–about 330 times as much water as fuel being required. The third important item is the transportation (or transmission) of the finished product from the point of manufacture to the areas where it is to be used. The large amount of water required is not used up, as we say, but merely used as a cooling medium for condensing the steam after it has passed through the turbines; hence it is necessary to dispose of this water, or extract the heat from it and use it over again. Therefore, there must be double transportation on this very large item, or expensive apparatus such as cooling towers must be installed. Such apparatus requires large areas, the cost of which in the city (where the energy is used) is prohibitive. After giving due consideration to the cost transporting the three main requisites, it was decided to build the plant at the ocean. Having reached this decision, it was next necessary to choose the location. Every inch of the coast from Topanga Canyon to the inlet of Newport Bay was studied, with the result that Seal Beach was chosen, because: (1) the water is free from sewage and sea-weed, (2) the ground is better for foundations, (3) it is close to fuel supply, and, (4) transmission lines will not be excessive in length. The site was purchased about the first of this year and ground was broken April 1. Plans for a station of 288,000 h.p. capacity have been drawn. During this year buildings sufficient to house two turbo-generator units will be built, and the first one of 48,000 h.p. capacity will be in operation by July 1, 1925. This plant will be designed and equipped to give the maximum fuel economy that the best engineers of the country know how to obtain with steam plants. The first unit will have three boilers, each capable of generating 175,000 lbs. of steam per hour continuously, at 385 lbs. gauge pressure. Each boiler will be equipped with a forced draft fan which will draw air from out-of-doors through a pre-heater, where it will be heated to 200 degrees F., and discharge it into the furnaces to supply combustion. The pre-heaters will use heat from the stack gases, which is ordinarily wasted. From the boilers the steam will pass through superheaters which will raise its temperature to 700 F. in order to get the highest efficiency from it in the turbines. The large amount of condensing water required is made necessary by the fact that when a pound of water is converted into steam, 970 British Thermal Units of heat are “used up.” That is, this quantity of heat enters into the process without raising the temperature of the medium. It is called “latent heat.” When the steam is condensed, in order to relieve the turbine from exhausting against atmospheric pressure, this latent heat appears again. It is picked up by the condensing water and entirely wasted ordinarily. During recent years engineers have found that by extracting some of the steam at various stages of its passage through the turbine, a considerable portion of the latent heat can be recovered and utilized for heating the boiler feed-water. This process is called “stage bleeding.” The first unit at Seal Beach will be equipped for four-stage bleeding which is as far as the process can be carried economically at this date. All of the auxiliaries are electrically driven and are supplied from a house generator which is on the end of the shaft of the main unit. This arrangement gives as high economy on the small apparatus as on the main unit, which could not be done with individual steam drive. One of the unusual features of the plant will be the smokestack, which will be 375 feet high and large enough to take the gases from six of the big boilers running at their maximum ratings. This tremendous chimney will be of reinforced concrete and will be supported on the steel structure of the building above the center of the boiler room. The current will be generated at 13,200 volts and stepped up to 110,000. It will be transmitted on a steel tower line to a step-down substation licated in the city limits as near to the load center as is economical to build. This entry was posted in Seal Beach History and tagged 1924, DWP, J G Rollow, power plant, Seal Beach, Steam Plant. Bookmark the permalink. Michael: nice piece about the power plant. Many of us would drop-line fish from a “secret” fishing place at the south end of the plant….mostly rock cod – but fun. Water was warmer than ocean and some fish seemed to like it….dunno why. Any Seal Beach “kid” will remember the nightly (I believe at 9:00 or 10:00 P.M.) “curfew whistle” emanating from the plant. When that puppy blew, you’d better be at home or on your way home or the local SBPD “enforcer”, I believe, Paul Crowe, would provide transportation for you. You may, if you haven’t already, want to pick Glenn Peasley’s gourd for some fun Seal Beach facts. Glenn spends a couple of days a week at The Irisher. And, of course, another gent with a good memory is the lovely Don Stegen…..you know where to find him. Also, “Chi” Kredell…now that Kinda’ Lahaina has been reopened under another name, you may find him there each morning. I did not spend enough time in Seal Beach as a “kid” ….. wish I had a time machine to go back to those halcyon days in the forties and early fifties. I promise I will get the SB Grammar School 1948 graduation list and the program for the eighth grade play, “The White Gipsy” to you…..when I can. Michael you truley are a historian of Seal Beach. The photos and stories you share always amaze and delight me. I’d love for you to write a guest column on my website. Thanks for the compliment, Nat. I’d be happy to do a column for you. Just let me know what length and what you sort of column you’re envisioning, and I can tell you what my fee will be. Michael what was the address of the Haynes location??? The Haynes location is at 6801 E. 2nd St Long Beach, CA 90803, and it’s currently run by the Los Angeles Department of Water and Power. There’s also another power plant right next to it known as AES Alamitos at 690 N Studebaker Rd, Long Beach, CA 90803.